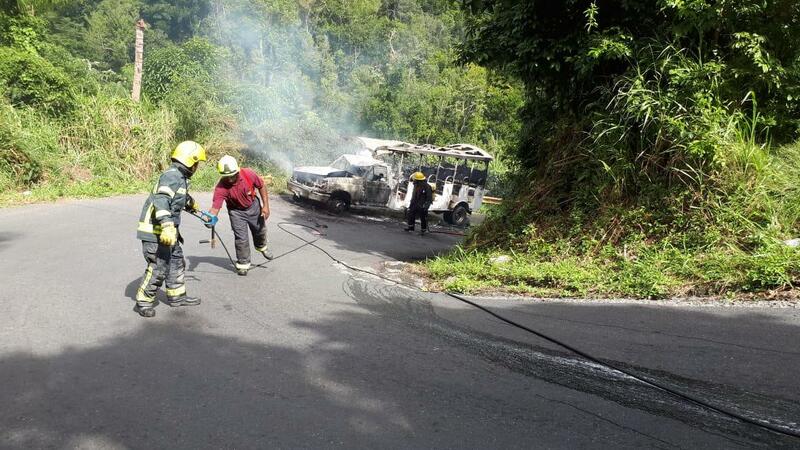 Officers of the Virgin Islands Fire and Rescue Service contained a vehicle fire near the top of Joe’s Hill road on Tortola today. Deputy Chief Fire Officer, Mr. William Penn said that two fire engines were dispatched in response to a call concerning a fire on the front end of a safari bus transporting tourists. While the Fire Service was en route to the scene, the driver of the safari bus made an attempt to extinguish the fire after the passengers were safely evacuated. No injuries were reported due to the fire. Mr. Penn said that within 20 minutes of arriving on the site of the incident, the fire officers extinguished the fire and made arrangements to have the safari bus removed from the vicinity so that the cause may be properly investigated and for the safety of motoring public in the area. The Deputy Chief Fire Officer commended the fire officers on a job well done. In keeping with the Fire Safety Awareness theme of 2018 ‘Make Fire Safety Your Routine’, he urged motorists to invest in small extinguishers, which can be carried onboard their vehicles. The Virgin Islands Fire and Rescue Service remains committed to the protection of life, property and the environment, through a proactive approach to continuously enhancing the quality of service provided.